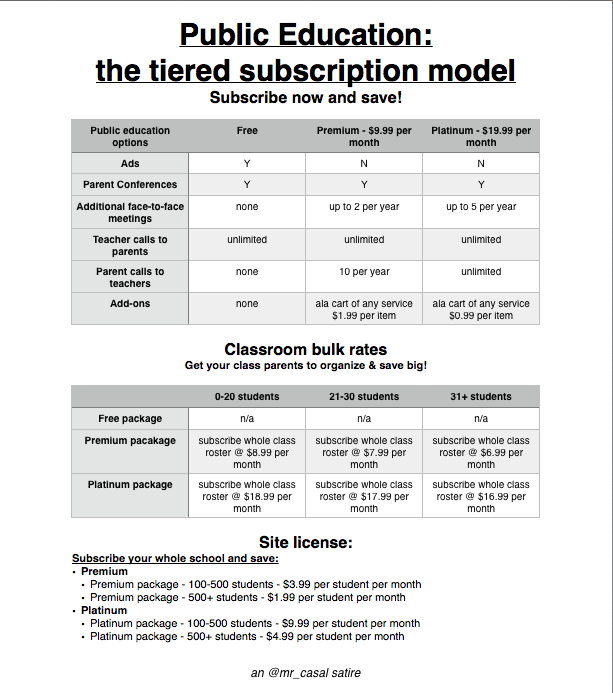 I think public schools should operate on a tiered subscription model. A nifty one page handout of the fantastic subscription options! Of course bulk discounts would be available so an entire class of parents can get together to ensure all students in the room are covered under the same plan. An Educators plan is possible too, for those teachers who are also parents of public school children, possibly free but will depend on the success of the other pricing structures. Think Spotify, Pandora, or Office365 but applied to public education. Teachers split the revenue with the school on a 50/50 scale, similar to the way Apple handles profits with app developers. Teachers are providing the service, but the school is providing the avenue for distribution, therefore profits will be split (and in the spirit of fairness, 50/50 seems reasonable). Ricky Bobby... rolf!!! Nice post Chris!